گل گون, ابوذر, علی اف خضرایی, محمود, طورانی, منصور, مرادی, محمد حسین, گل گون, احسان. (1395). بررسی ساختار و خواص خوردگی پوشش نانوکامپوزیتی پلی‌استر-نانو‌رس و تاثیر نوع پخت بر خواص پوشش. 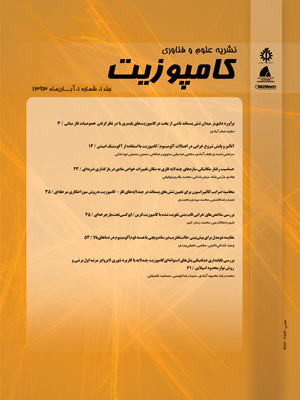 علوم و فناوری کامپوزیت, 3(1), 51-58. ابوذر گل گون; محمود علی اف خضرایی; منصور طورانی; محمد حسین مرادی; احسان گل گون. "بررسی ساختار و خواص خوردگی پوشش نانوکامپوزیتی پلی‌استر-نانو‌رس و تاثیر نوع پخت بر خواص پوشش". علوم و فناوری کامپوزیت, 3, 1, 1395, 51-58. گل گون, ابوذر, علی اف خضرایی, محمود, طورانی, منصور, مرادی, محمد حسین, گل گون, احسان. (1395). 'بررسی ساختار و خواص خوردگی پوشش نانوکامپوزیتی پلی‌استر-نانو‌رس و تاثیر نوع پخت بر خواص پوشش', علوم و فناوری کامپوزیت, 3(1), pp. 51-58. گل گون, ابوذر, علی اف خضرایی, محمود, طورانی, منصور, مرادی, محمد حسین, گل گون, احسان. بررسی ساختار و خواص خوردگی پوشش نانوکامپوزیتی پلی‌استر-نانو‌رس و تاثیر نوع پخت بر خواص پوشش. علوم و فناوری کامپوزیت, 1395; 3(1): 51-58. در این مقاله به بررسی خواص خوردگی، ساختار و مورفولوژی پوشش‌های پلیمری ایجاد شده به‌کمک دستگاه پاشش الکترواستاتیک پرداخته ‌شده است. به این منظور نانوذرات رس به میزان 5% وزنی درون زمینه پلیمر پلی‌استری به‌کمک روش‌های متوالی و مختلف اختلاط به‌خوبی پراکنده‌شده و سپس پودر نانوکامپوزیتی تهیه ‌شده به‌کمک روش پاشش الکترواستاتیک روی سطح قطعات فولاد ساده کربنی پوشش داده ‌شده و با پوشش‌های پلی‌استری خالص مقایسه شدند. مورفولوژی و ساختار نانوذرات‌ رس توسط میکروسکوپ الکترونی روبشی و عبوری بررسی شد. تصاویر میکروسکوپ الکترونی روبشی و عبوری مربوط به نانوذرات ‌رس نشان دهنده صفحات لایه‌لایه ‌رس می‌باشد. تصاویر میکروسکوپ الکترونی روبشی پوشش‌ها نشان می‌دهد که با افزودن نانوذرات ‌رس، میزان حفرات پوشش‌های نانوکامپوزیتی نسبت به پوشش‌های خالص کاهش ‌یافته است. همچنین با استفاده از آزمون‌های غوطه‌وری و طیف‌سنجی امپدانس الکتروشیمیایی، خواص خوردگی پوشش‌ها بررسی شد. نتایج آزمون‌های خوردگی نشان می‌دهند که مقاومت به خوردگی پوشش نانوکامپوزیتی در اثر افزودن نانوذرات ‌رس افزایش‌ یافته است. Jegdic, B. V. Bajat, J. B. Popic, J. P. and Miškovic-Stankovic, V. B.,“Corrosion Stability of Polyester Coatings on Steel Pretreated with Different Iron–Phosphate Coatings,” Prog. Org. Coatings, Vol. 70, No. 2, pp. 127–133, 2011. Zhang, X. Wang, F. and Du, Y., “Effect of Nano-Sized Titanium Powder Addition on Corrosion Performance of Epoxy Coatings,” Surf. Coatings Technol., Vol. 201, No. 16, pp. 7241–7245, 2007. Zaarei, D. Sarabi, A. A. Sharif, F. Kassiriha, S. M. and Gudarzi, M. M., “Preparation and Evaluation of Epoxy-Clay Nanocomposite Coatings for Corrosion Protection,” Vol. 7, No. 2, pp. 126–136, 2010. Cho, K. S. Hong, J. and Chung, C. I., “Effects of ZnO nano particles on thermal stabilization of polymers,” Polym. Eng. Sci., Vol. 44, No. 9, pp. 1702–1706, 2004. Yu, H. J. Wang, L. Shi, Q. Jiang, G. H. Zhao, Z. R. and Dong, X. C., “Study on nano-CaCO< sub> 3</sub> Modified Epoxy Powder Coatings,” Prog. Org. coatings, Vol. 55, No. 3, pp. 296–300, 2006. Bagherzadeh M. R. and Mahdavi, F., “Preparation of Epoxy–Clay Nanocomposite and Investigation on its Anti-Corrosive Behavior in Epoxy Coating,” Prog. Org. Coatings, Vol. 60, No. 2, pp. 117–120, 2007. Huttunen-Saarivirta, E. Vaganov, G. V. Yudin, V. E. and Vuorinen, J., “Characterization and Corrosion Protection Properties of Epoxy Powder Coatings Containing Nanoclays,” Prog. Org. Coatings, Vol. 76, No. 4, pp. 757–767, 2013. Ashassi-sorkhabi H. and Seifzadeh, D., “Analysis of Electrochemical Noise Data in both Time and Frequency Domains to Evaluate the Effect of ZnO Nanopowder Addition on the Corrosion Protection Performance of Epoxy Coatings,” Arab. J. Chem., 2012. Piazza, D. Silveira, D. S. Lorandi, N. P. Birriel, E. J. Scienza, L. C. and Zattera, A. J., “Polyester-Based Powder Coatings with Montmorillonite Nanoparticles Applied on Carbon Steel,” Prog. Org. Coatings, Vol. 73, No. 1, pp. 42–46, 2012. Soesatyo, B. Blicblau, A. S. and Siores, E., “Effects of Microwave Curing Carbon Doped Epoxy Adhesive-Polycarbonate Joints,” Int. J. Adhes. Adhes., Vol. 20, No. 6, pp. 489–495, 2000. Naderi, R. Attar, M. M. and Moayed, M. H., “EIS Examination of Mill Scale on Mild Steel with Polyester–Epoxy Powder Coating,” Prog. Org. Coatings, Vol. 50, No. 3, pp. 162–165, 2004. Ruhi G. and Dhawan, S. K., “Conducting Polymer Nano Composite Epoxy Coatings for Anticorrosive Applications,” . Deshpande, N. G. Gudage, Y. G. Sharma, R. Vyas, J. C. Kim, J. B. and Lee, Y. P., “Studies on Tin Oxide-Intercalated Polyaniline Nanocomposite for Ammonia Gas Sensing Applications,” Sensors Actuators B Chem., Vol. 138, No. 1, pp. 76–84, 2009. Osuna, R. M. Bethencourt, M. and Botana, F. J., “Monitoring the Degradation of a High Solids Epoxy Coating by Means of EIS and EN,” Vol. 60, pp. 248–254, 2007. Ashassi-Sorkhabi, H. Seifzadeh, D. and Harrafi, H., “Phosphatation of Iron Powder Metallurgical Samples for Corrosion Protection,” J. Iran. Chem. Soc., Vol. 4, No. 1, pp. 72–77, 2007. Bakhshandeh, E. Jannesari, A. Ranjbar, Z. and Sobhani, S., “Progress in Organic Coatings Anti-Corrosion Hybrid Coatings Based on Epoxy – Silica Nano-Composites : Toward relationship between the morphology and EIS data,” Prog. Org. Coatings, Vol. 77, No. 7, pp. 1169–1183, 2014. Macdonald J. R. and Johnson, W. B., “Fundamentals of Impedance Spectroscopy,” Impedance Spectrosc. Theory, Exp. Appl. Second Ed., pp. 1–26, 2005. Behzadnasab, M. Mirabedini, S. M. and Esfandeh, M., “Corrosion Protection of Steel by Epoxy Nanocomposite Coatings Containing Various Combinations of Clay and Nanoparticulate Zirconia,” Corros. Sci., Vol. 75, pp. 134–141, 2013. Mirabedini, S. M. Thompson, G. E. Moradian, S. and Scantlebury, J. D., “Corrosion Performance of Powder Coated Aluminium Using EIS,” Prog. Org. coatings, Vol. 46, No. 2, pp. 112–120, 2003. Huttunen-saarivirta, E. Vaganov, G. V. Yudin, V. E. and Vuorinen, J., “Progress in Organic Coatings Characterization and Corrosion Protection Properties of Epoxy Powder Coatings Containing Nanoclays,” Prog. Org. Coatings, Vol. 76, No. 4, pp. 757–767, 2013. Kendig M. W. and Leidheiser, H., “Proceedings of the Symposium on Corrosion Protection by Organic Coatings, 1987, SL,” Proceedings; N87-2/Electrochem. soc, 1987. Deflorian, F. Fedrizzi, L. Rossi, S. and Bonora, P. L., “Organic Coating Capacitance Measurement by EIS: Ideal and Actual Trends,” Electrochim. Acta, Vol. 44, No. 24, pp. 4243–4249, 1999.